Lukas Nelson discusses working with Neil Young in an interview with Chris Shiflett on the Walking the Floor podcast. "I was playing Farm Aid with my band, and we covered this one song of Neil's, "L.A.," off of Time Fades Away, which is a super-obscure Neil album," remembers Nelson. "We covered that song four or five years ago, and Neil came up to me and said, 'Hey man, that's great.'" That casual conversation kicked off a longstanding friendship that has since grown into an onstage collaboration, with Nelson and his bandmates joining Young in the studio for his thirty-sixth album, The Monsanto Years. When Young released the record in 2015, he hired Lukas Nelson & Promise of the Real as his backup band. "We all came from the same cosmic soul cluster," Nelson says proudly, adding, "The last two years of playing with Neil has just been a constant elation." More on Lukas Nelson and Neil Young. Hah! Gotta love Lukas Nelson referring to TFA as a "super obscure Neil album", but I guess it to most casual listeners. The fact that it was never reissued for decades would tend to have that effect. Yonder Stands the Sinner; The Bridge... it's a real shame those songs have been buried for so long. I hope Archives II, if it ever comes along, restores them fully to prominence. I believe that Archives II, if it's ever released, will include an entirely different set of TFA songs and venues. Anyone heard this rumor? @ Ian - it is kind of funny Lukas referring to TFA as a "super obscure Neil album". While still unreleased on CD (but coming soon! ), it is obscure to public, altho dearly beloved by rusties. 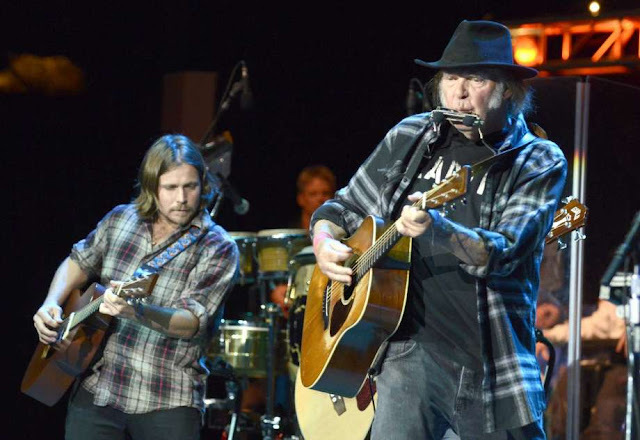 "NEIL YOUNG: One thing I'll tell you about the next volume of Archives is that Time Fades Away II is in there. And it's interesting because the whole thing has a different drummer than what was on that album. I switched drummers halfway through the tour- Kenny Buttrey was in there for the first half, and Johnny Barbata came in for the second. It's a completely different thing, with completely different songs. So that's interesting. There's lots of stuff like that that I'm working on right now for the second volume." Time Fades Away was recorded directly from the soundboard to 16-track using the Quad-8 CompuMix, the unreliable first digital mixing soundboard—against the wishes of producer David Briggs, who referred to it as the "Compufuck" but was forced to yield to the desires of Young. This resulted in a murky-sounding release. Because no two-track stereo master tape was ever made as would commonly be done, the album cannot be remastered in a traditional manner. If any new release was to be attempted, a new mix would need to be made from the original multitrack tapes. Great interview,enjoyed it alot.Gonna listen to it again.Tomorrow! Pretty cool how they choose which songs to play off of Neil setlist board.Ive bought all of the potr albums and look forward to the new one coming in august.